This document sets out a strategy for information management and technology capabilities within DST Group. It takes into account a range of external factors and DST Group’s strategic objectives. 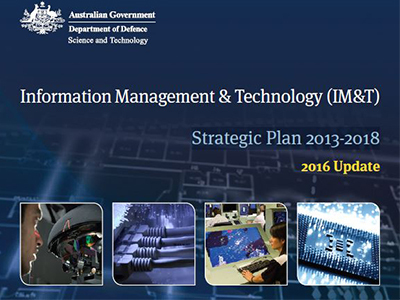 The IM&T Strategic Plan has been developed to support the DST Group Strategic Plan 2013-2018. DST Group's vision is to be a world leader in defence science and technology – indispensible in supporting and transforming Australia's defence and national security. DST Group's purpose is as a national leader in safeguarding Australia by delivering valued scientific advice and innovative technology solutions for Defence and national security.